Take a 360-degree journey through our state-of-the-art demonstration theatre. 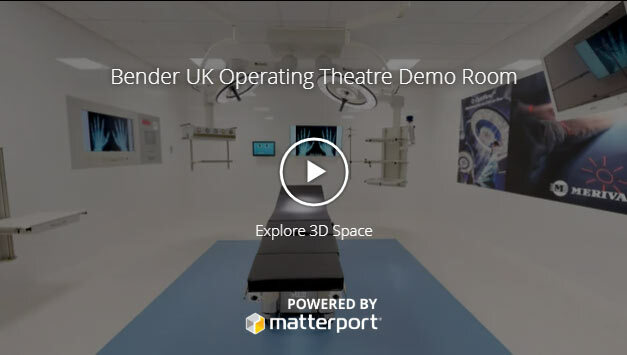 Experience our new operating theatre 3D virtual tour. Take a 360-degree journey through our state-of-the-art demonstration theatre. This panoramic tour brings our theatre to life through your chosen technology. Embark on a journey and explore Bender UK theatre technology. Experience and view Bender clinical pendants, new glass and traditional stainless theatre control panels, alarm panels, Merivaara Q-Flow lights and Promerix table and Jones AV systems as if you are really there. Product information can be accessed quickly and easily through equipment hyperlinks. Why wait, take your journey today and visit our theatre as often as you like!